Infection! A Zombie-slaying, axe throwing game for Halloween. Infection! The Halloween axe throwing game! This past Halloween, our Indianapolis venue had an very successful axe throwing event for Charity. One of the most successful aspects was the custom game made by our awesome coaches. Pitting axe throwing humans vs zombies in the new game: Infection! 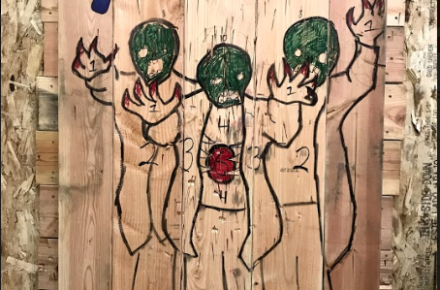 Can you take out a zombie with your axe throwing skills? This game is particularly good for large groups, but any sized group is sure to have fun chopping zombies! The theme of this game is that you group of humans are trying to survive a zombie apocalypse with only your trusty axes to help you defeat the shambling horde! Unfortunately one of your friends just happened to be Patient Zero, the undead that started it all. Start the game with two teams. Zombies: One person (Patient Zero). Humans: Everyone else in the group. Zombie Objective: To spread the undead plague by defeating the human players in single matches. which will turn them into zombies. Human objective: To gain enough points to escape the Zombie horde. One Zombie player (Patient Zero) will go up against a human player and throw one at a time. (humans first) A match can be as many throws as the judge would like. For large groups we suggest 2 or 3 throws, for small groups we would suggest 5 to 10 throws. The scores can be decided and changed as you like, but we decided to do the points like this example below. Also keep in mind your zombies can be drawn differently. No zombie is alike! Points from least to highest. Every time a Zombie player scores higher a Human player in total match points, that human player switches to the zombie team. Growing the horde one person at a time. 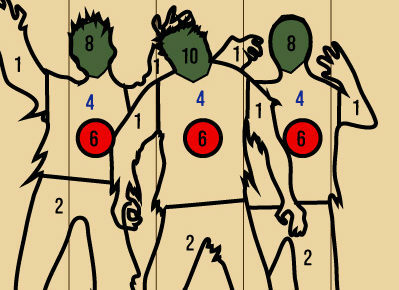 If the human beats the zombie player, calculate how many points over the zombie, the human scored. That point total goes to the human side. Zombies: If they convert all humans to zombies. Humans: If they get enough points to reach the goal. We recommend 30 for small groups and up to 60-100 for large groups. Antidote: If you like you can draw a small vial of antidote above the zombies. If a human player hits that bottle then that can select one zombie to come back over to the human team. The only zombie that can’t be turned back into a human is Patient Zero, the first zombie! Bomb: You can draw a small grenade or Molotov bottle to represent a zombie bomb. If struck it would destroy multiple zombies. When this happens you cain double the points of you last throw. For example: 1st throw 4 points. Second throw you hit the bomb which will count for 8 points. Two throws equal 12 points. With this game, your friends will be 100% prepared for the zombie apocalypse in no time! With as great a success as it is, we hope that maybe next Halloween we’ll see it return to ALL our bad axe locations. Whether training to fight zombies or just wanting to have some fun, we guarantee not only an amazing experience but memories that will last a lifetime. Book with us today—spots fill quickly! Axes & Ales in Denver: Applying for Our Liquor License!